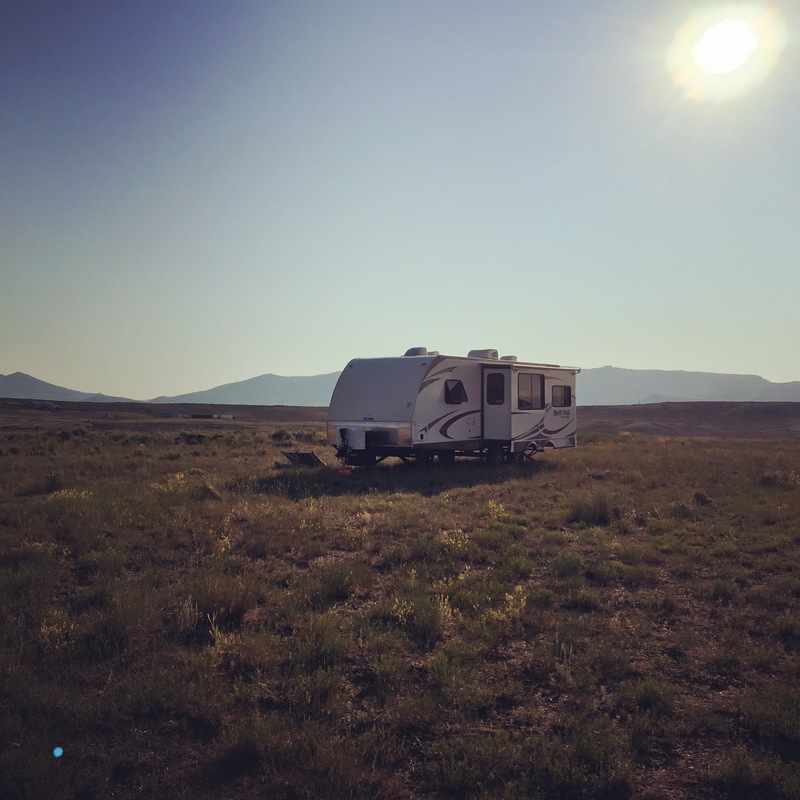 Boondocking is parking for free out in the boonies. I had been nervous to just go somewhere and park. Lots of obvious reasons: number one on my list is that ever present desire to not get stuck. What if the roads are too narrow, what if I need to turn around? Another hurdle is that this is Colorado, and everyone in their mother is here camping in the summer. It has been a bit of a hustle finding regular camping spots let alone a free one. Even up until this week there were two nights I didn’t have a place to park for next weekend, and I have a show on Saturday – everything was booked. Finding a spot was mandatory, as I don’t want to leave the trailer without the truck somewhere out there. 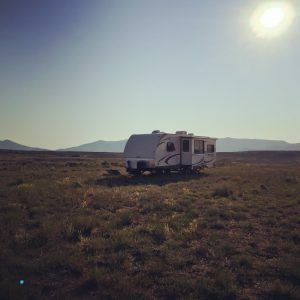 Thank goodness for RVParkReviews, I found a new (to me) local campground in Westminster. I don’t have high expectations for it to be gorgeous, but it’s a spot (and reasonably priced!). Back to the boondocking. A few months back, I joined a site called Boondockers Welcome where people offer up their land for you to park on. So, I reached out to a user, Hatchet Jack (ominous? no.) to see if I could park during my show in Grand Lake, which I was going straight to from the trip back from Montana. I would need to park for 3-4 nights, and my motivation was that I didn’t really want to stay in the National Forest campground, Green Ridge, where I had parked in June. I was up til 1am with my neighbor running his generator. While a nice setting, I didn’t really feel the need to experience that again, and it was tight quarters. Jack said that I was more than welcome to come and stay, and we coordinated his location and arrivals. He has 40 acres and a great place to park that has such a great view, private and perfect! I heard coyotes one night, and watched the sun rise the next morning. Tons of elbow room, just what I needed to recharge, not to mention the price. I also got to really test out my solar panels, and all works well there. I was looking forward to using a new toy, the ChargeTech charging station. As you know, I am really starting at square one with how this trailer works. Despite having solar and a battery array, the damn plugs don’t work when boondocking. It’s a thing having to do with the voltage. One of the many things I wish I knew that ahead of time. And yes, I could get an inverter, and I just may do so, but I also really don’t need outlets except for 2 things: iPhone and MacBook Pro. I opted for the battery pack, as it has a lot of charging power, it’s portable, so I can also use it at shows if needed, and it has a regular outlet on it. So if I am dying for toast, or want to plug in a string of lights for the booth, those are options. I didn’t get to use that back up option though… it was delivered to my address, but was gone within 2 hours of delivery*. Thanks to Amazon, they refunded me and I purchased another, but it did not arrive in time for this experiment. Today, I have rolled back in to Hatchet Jack’s spot for my second stay. I am setting up my booth for a show in Winter Park. As I determined, my gas money commuting to these shows is definitely less than a nights stay in a campground, and that commute is lovely! I will be trying out the battery pack tonight to charge the iPhone. *What I eventually did find out was that at my address, a pair of newly weds scooped up my package, along with other wedding registry packages that were delivered, then they went on their honeymoon. It was returned 3 weeks later when they returned to find the mistake. Now I have two. So awesome that people allow others to stay on their land, and want nothing in return but for them to clean up after themselves. So different from here! !